George D. Davis, a wilderness preservationist who served as Executive Director of the Wilderness Society (1974-75), was the principal partner in Davis Associates, an international land-use-policy consulting firm, and president of Ecologically Sustainable Development, the nonprofit successor to Davis Associates. He worked for thirty years in natural resource management, land-use planning, and environmental policy at the state, national, and international level as well as in the private sector. The first professional planner for the Adirondack Park Agency formed in 1971, he helped to prepare that area’s wilderness guidelines, maps, and plans. In 1989 he became Executive Director of the New York State Commission on the Adirondacks in the Twenty-First Century. In the early 1990s Davis led an international effort to develop a comprehensive land use and allocation program for the Lake Baikal watershed in Siberia and for the Ussuri River watershed in Russia and China. His work in the Baikal watershed represented a major step toward international acceptance of democratic and ecologically sustainable land use policy and economic development. He was also active in preserving land and water resources of the Miskito Indians in Nicaragua and Honduras. His publications include Developing a Land Conservation Strategy: A Handbook for Land Trusts (1987), The Adirondack Park in the Twenty-First Century (1990), and A Sustainable Land Use and Allocation Program for the Ussuri River Watershed and Adjacent Territories (1996). Holding a B.S. in forestry from the State University of New York at Syracuse, he also did graduate work in conservation at Colorado State University and Cornell University. 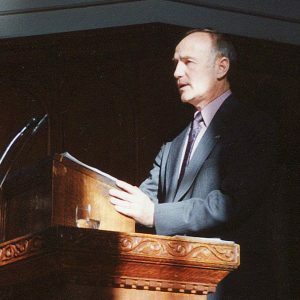 Davis was the recipient of a MacArthur Fellowship in 1989.